Announcements about locating a life-enhancing medicinal herb will kindle extraordinary emotions and hopes among people. So, the news that the present Uttarakhand government has announced a budget of INR 25 crore to locate the mythical Sanjivani Booti in Uttarakhand, went viral. This plant is referred to in the Valmiki Ramayana, when Ram was battling the forces of Ravana in the far off lands of Sri lanka. When his brother Lakshman was fatally wounded during the battle Rama sent for Sushena Vaidya to help revive him. 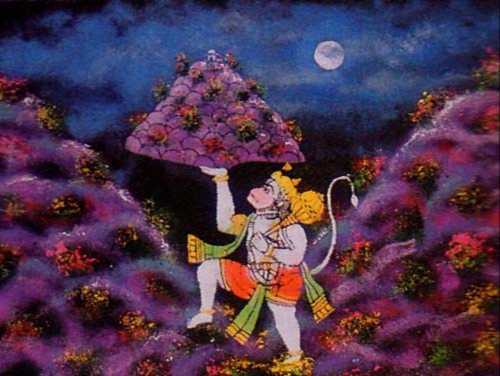 Sushena Vaidya, it is said, ordered Ram’s main attendant, Hanuman to fly to the greatest among the mountains, the Himalayas (Nag Sreshta Himavant) and bring him the Mrit Sanjivani (literally an infuser of life) plant so that he could revive the comatose young warrior. The plant grows in the Drongiri range, he tells Hanuman, and because it gives off a strange light, it can be spotted in the dark. Hanuman left without losing time but when he arrived among the mountains, he was confused and did not know where to look. Finally, the epic says, rather than delay matters any further, this son of the Wind God excised an entire hillside that was said to contain the plant, and took off. Lakshmana was revived and the rest, as they say, is history. Today the Sanjivani Booti for scientists remains a mythical plant with little or no scientific proof of its existence. But the locals claim it can still be located if the government mounts an aggressive search in the remote region bordering Tibet. In 2009, the BJP government led by the poet CM Ramesh Pokhariyal “Nihshank”, had similarly announced a budget of some INR 6 lakh for the search and applied to the (then Congress-led) Central Government for an additional grant. Unfortunately the grant never came after which the plan fizzled out. But the present (Congress-led) State Government has announced a more ambitious budget of INR 25 crore, so things may pan out better. But this time there is a BJP-led government at the Centre, which has predictably turned down the request for an additional grant. The State Minister in charge of alternative medicine, Surendra Singh Negi, who controls Ayush, the department that will be carrying out the search, is expected to lead it. In case they do locate the magical glowing plant, it will be the silver bullet Harish Rawat, the present Chief Minister, needs to fill the coffers of his government and win next year’s Assembly Elections. It is also notable that according to some reports Om Prakash, Secretary of the department concerned, has gone on record to say that there never was any move to make a proposal for seeking Central funding. If naturopathy is the name of the game, can Baba Ramdev’s Ashram stay behind? Recently, Baba’s disciple and business associate in chief, Balkrishna, asserted that he has located two Sanjivani plants. He has, however, not revealed anything more thereafter. Be that as it may, let’s go back to the various names and description of Sanjivani Booti, from ancient myths that have travelled to lands as far off as Indonesia, Cambodia and of course Sri Lanka where Hanuman had carried half a mountain containing this plant. The name Sanjivani occurs not only in the Ramayana, but also in Mahabharata where the Asura Guru Shukracharya is said to have used it to bring back Asuras to life after they had been killed by the Devas. The same herb is also said have helped king Yayati to reverse the ageing of his body and regain male vigour. Ancient dictionaries like the Marathi Sanskrit Geervan Laghu kosh and the Sanskrit Shabd Kalpdrum, call it Rudanti or Rudantika, meaning a plant that oozes a liquid. Shabd Kalpadrum also calls it Romanchika, a nerve stimulator that can arouse a patient from Coma. But history has continued beyond Ramayana in the Drongiri village from where Hanuman had brought the miracle plant, and in the process destroyed the right side of the holy mountain (Parvat Dev). This hard to access village (the 45 kms long bus ride from Joshimath to Jumma, has to be followed by a tedious trek for 8 kms) is home to some 400 Bhotiya families who migrate during the severe winters to villages at lower altitudes. This area measuring 5.5 kms has at least 500 glaciers like Bagini, Changbang and Neeti, and attracts a host of poeple from outside during the summers: mostly gatherers of rare herbs and hunters looking (illegally) to hunt the musk deer and Himalayan bear. The Kidi herb, a kind of natural Viagra, that the locals collect from the grassy areas (Bugyal) fetch a most handsome price in the plains from where it is smuggled into China and other South East Asian countries for a fortune. Nothing much can be grown at this altitude (3610 metres) so the villagers live by breeding sheep and gathering herbs for selling in the city. In this ecologically sensitive zone, Hanuman still remains unforgiven though. For the villagers of the Dronagiri village he is the destroyer of the right flank of a holy mountain they worship. It is said that during the Treta Yug when Hanuman flew in to carry away the Sanjivani Booti for reviving his lord’s younger brother, the villagers did not allow him passage. Since time was running out, Hanuman dressed as a bedraggled Sadhu and begged an elderly woman in the village to help him locate the magic mountain where the herb grew. The matriarch was sufficiently moved by his plea and pointed out the carefully covered up area to the intruder who then proceeded to disfigure the mountain and carry away the magic plant. The old woman was then banished from the village and all women were then barred from the ritual worship of the mountain. Ecological preservation has been a way of life in the Himalayan villages ever since human families settled there. And any deliberate degradation of the local topography, flora or fauna brings up extraordinary emotions. Since Hanuman had dared destroy a hillside, even today, temples in the area refuse to house an idol of Hanuman. At the formal celebration of Jagar in the village, when the spirit of the Dev Parbat appears in the body of a medium (known as Pashuwa) amid chanting of prayers, the right arm (symbolic of the right flank of the Drongiri hill) hangs limp and lifeless till the soul of the Parbat Devta departs. At the annual staging of a three day Ramlila too, all references to Hanuman have been expunged for centuries. Even today, when the state being dubbed Dev Bhumi or abode of gods is enjoying a period of accelerated growth of temples and attracting vast crowds of the faithful, the Ramlila in this village will still begin with Ram’s childhood, move on to his wedding following a Swayamvar to Sita and ends with his coronation. If Hanuman is still not forgiven by the guardians of the holy mountain and of the life enhancing herb that glows in the dark, does a government of mere mortals stand a chance?